Eta Carinae’s great eruption in the 1840s created the billowing Homunculus Nebula, imaged here by Hubble. Now about a light-year long, the expanding cloud contains enough material to make at least 10 copies of our Sun. Astronomers cannot yet explain what caused this eruption. Eta Carinae shines in X-rays in this image from NASA’s Chandra X-ray Observatory. The colors indicate different energies. 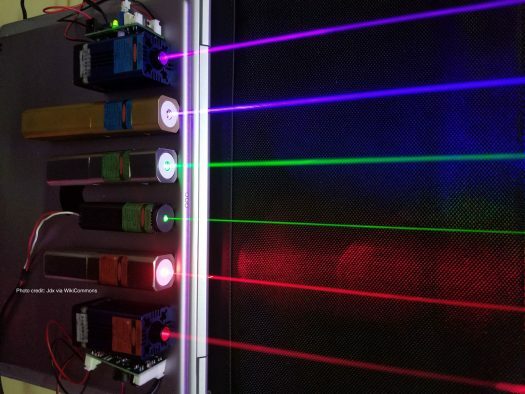 Red spans 300 to 1,000 electron volts (eV), green ranges from 1,000 to 3,000 eV and blue covers 3,000 to 10,000 eV. For comparison, the energy of visible light is about 2 to 3 eV. 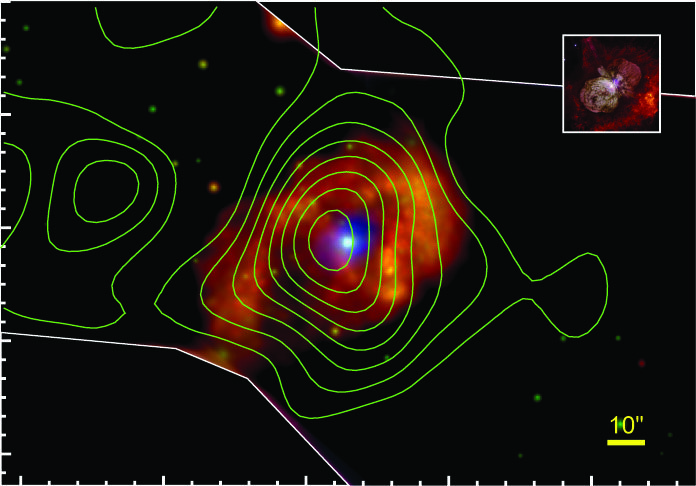 NuSTAR observations (green contours) reveal a source of X-rays with energies some three times higher than Chandra detects. X-rays seen from the central point source arise from the binary’s stellar wind collision. The NuSTAR detection shows that shock waves in the wind collision zone accelerate charged particles like electrons and protons to near the speed of light. Some of these may reach Earth, where they will be detected as cosmic ray particles. 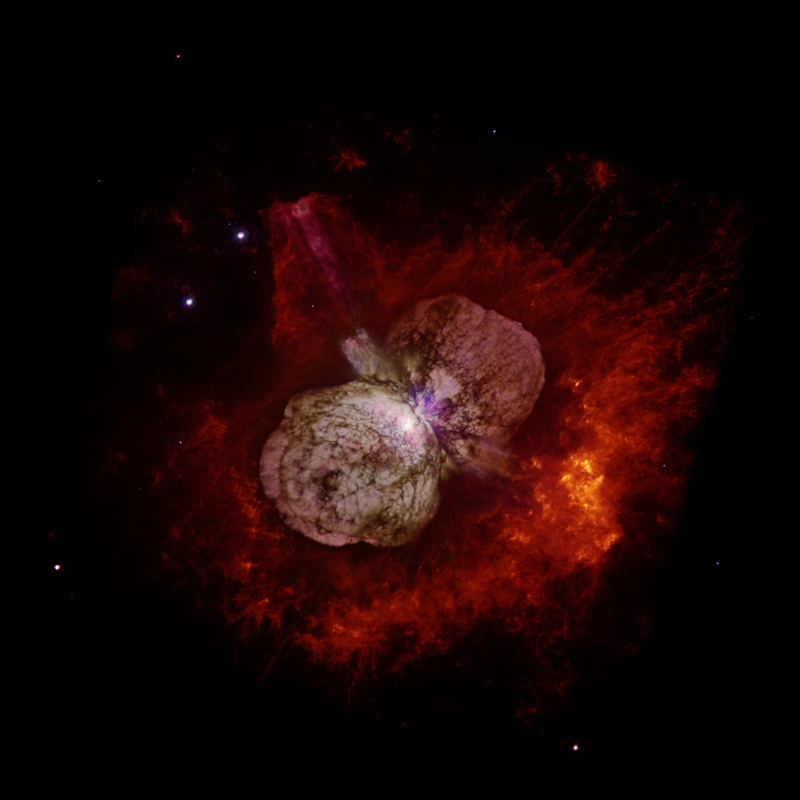 X-rays scattered by debris ejected in Eta Carinae’s famous 1840 eruption may produce the broader red emission. “The key to accurately measuring eta Car’s X-rays and identifying the star system as the gamma ray source — and thus proving that the colliding winds of this binary system are accelerating cosmic rays — was to fully characterize NuSTAR’s background,” said coauthor Daniel Wik, assistant professor at the University of Utah. Wik previously developed a multi-component background model for the NuSTAR mission, but eta Car’s location in the plane of the Milky Way caused the background of NuSTAR’s 9 separate observations to be more complicated than usual. He helped identify additional sources of background and how to account for them, allowing the link between Eta Carinae X-ray and gamma ray emission to become clear. 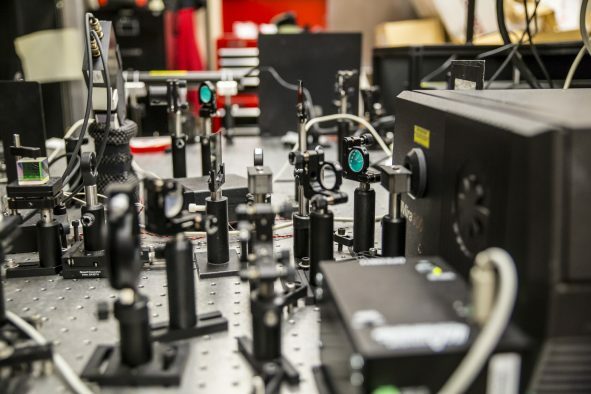 The team’s analysis, presented in a paper published on Monday, July 2, in Nature Astronomy,shows that these “hard” X-rays vary with the binary orbital period and show a similar pattern of energy output as the gamma rays observed by Fermi.